depending on what career path said person has taken. The sad fact of the matter is that less than 10% of people suffering from tooth pain or other signs of future tooth loss ever see a dentist (or dental professional); because nearly all tooth loss is preventable, this is simply unacceptable! Dental phobia, the fear of being judged by a dentist or financial troubles are often contributing factors in why most people suffering from tooth pain never see a dentist, but the consequence of delaying (or avoiding all together) a dental check-up often results in loosing one or more teeth. Worst of all, oral health problems are systematic (meaning they can affect other systems or parts of the body and problems grow with time, making the need to see your dentist that much more urgent if you are suffering from tooth pain. 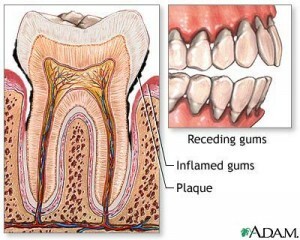 Of course, tooth loss in rare incidences could be due to injury or genetic problems, mainly caused by poor oral hygiene, bad oral habits leading to tooth and gum disease and eventually tooth loss. For starters, brushing and flossing twice daily and after meals is essential! When food particles are left behind embedded between tooth crevices, bacteria begins a destructive process which eats away at your teeth and gum. Secondly, eating sugary, carbohydrate-laden foods and drinking sugary beverages [frequently] without prompt proper care can erode the enamel on your teeth, making you more prone to tooth loss and gum disease. Without timely dental care, these habits will lead to an untreatable situation and inevitable tooth loss. To prevent all that unpleasantness (and the costly consequences of tooth loss the best solution is prevention. Prevention means having a terrific home care program, proper diet and habit and getting your regular dental cleanings and check ups every year. When the problem is small (or in a earlier stage of deterioration problems are much easier to correct and restore. To the end the effort is all worthy, and having a healthy mouth is truly the foundation of good physical health (you can eat and digest healthy, high fibrous food) and mental health (self esteem and being able to smile with confidence)!